Premium ice creams made from milk, cream, and sugar can claim to be less highly processed and perhaps more “natural.” They are also deliciously rich–meaning, high in sugar, fat, and calories. If you’re the type that can savor the recommended (but ridiculously small) half-cup serving size, you can enjoy a decadent treat without doing too much damage. The problem is that most of us can easily plow through an entire pint of Ben and Jerry’s (did I mention the part about delicious? ), at which point we’ve consumed a half day’s worth of calories and four day’s worth of added sugar. One of the big attractions of Halo Top ice cream is that you can eat the entire pint for about the same number of calories as a tiny scoop of Ben and Jerry’s. You also get 20 grams of high-quality protein, 12 grams of fiber, and 24 grams (one day’s worth) of added sugars. For many people, Halo Top wouldn’t just be a healthier dessert option; it would make a more nutritious breakfast! Although taste is highly subjective, I actually think they taste pretty darned good. Which is surprising when you look at the ingredient list, which contains things like erythritol, prebiotic fiber, milk protein concentrate, vegetable glycerin, organic guar gum and organic stevia leaf extract (in addition to things like milk, eggs, cream, and cane sugar). This is not a minimally-processed food, by any stretch of the imagination. But perhaps this is processing put to a good cause. How Processed is Too Processed? We often invoke “processed foods” as the villain–but this is painting with an awfully broad brush. While processing can be used to turn cheap ingredients into hyper-palatable but nutritionally void junk food, it can also be put to more noble uses. Processing milk into yogurt adds beneficial bacteria. Processing tomatoes into sauce renders the antioxidants more bioavailable. Processing can make foods more digestible, decrease contaminants, add convenience, and reduce food waste. Although few of the ingredients in Halo Top appear in their “whole food” forms, none are particularly worrisome. In their efforts to reduce added sugars (a laudable goal), they’ve avoided the most objectionable artificial sweeteners. Protein and prebiotics in the name of reducing fat and calories? That doesn’t seem like such a bad deal. I wouldn’t go out of my way to eat this product merely for its nutritional benefits. (I was just kidding about the breakfast.) But as a satisfying treat that doesn’t blow the calorie budget (and offers some nutritional benefits as well) I can see the both the value and the appeal. See also: Can Processed Food Be Healthy? I tried this and I found it to be really gritty. Really? I didn’t notice that. But I rarely eat the premium ice creams (because I’m one of those who can’t have just a half cup) so perhaps it depends on what you’re comparing it to. Food texture is a huge issue for me anyway. It was really tasty though. I did like it. I’m so glad to hear this! 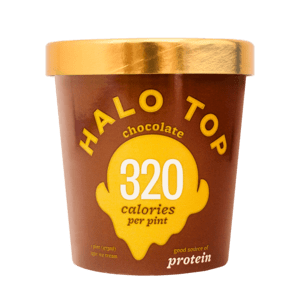 We usually make our own ice cream (with liquid stevia), when we have to have it, but we LOVE the taste of Halo Top ice creams. So when we feel like splurging (or get a coupon), we sometimes buy our own individual pints for a special occasion. Yeah, that whole “half-cup serving” thing doesn’t work for me, either! Fortunately, both Haagen Daz and Ben & Jerry’s are sold in half-cup sizes at the grocery store so I don’t have to buy an entire impossible-to-resist pint. I just buy four half cups! Just kidding, I buy 1 half cup if I am REALLY craving some ice cream. But nothing beats home-made, particularly with grass-fed dairy.